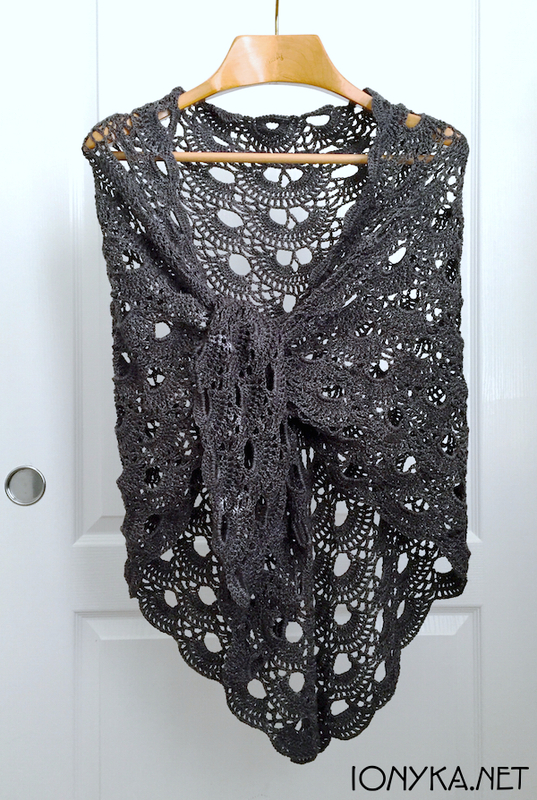 This entry was posted in General News, New Project, Patterns and tagged german scalloped triangle shawl, red heart, shawl, tidal by ionyka. Bookmark the permalink. This is stunning! Absolutely gorgeous. Thanks so much Karla! You are welcome to link a photo of this project on your site but know that the original pattern I followed is not mine and credit should be given to the owner, you can find the link in the post. I only wrote out the modification I did to the edging here in my blog post. You are welcome to link to this post in reference to my pattern modification though too. Thanks have a great week! I’m having trouble finding the link to the pattern in English, do you have a link that works? 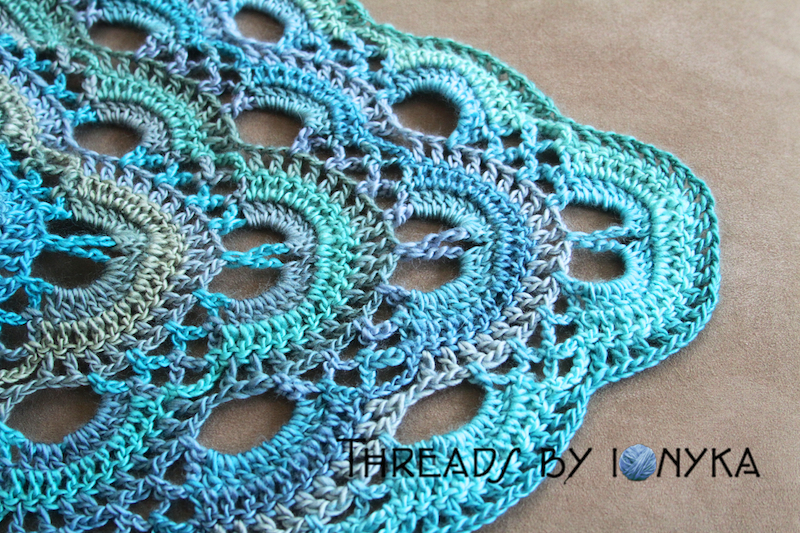 The shawl looks fabulous… Did you wash the shawl after it is done? Because Red heart Unforgettable is always very fussy and its unable to frog it…. But yours looks great… Any suggestions? Thank you so much! This was the first time I used this yarn so I learned like yourself that it is a bit fussy. I did not wash it, it seemed to keep its shape well once I was finished so I cannot offer too much advice for that step if you choose to do it. I did tell the lady I sold it too if she needed to clean it to spot clean gently if needed so it does not get stretched out. 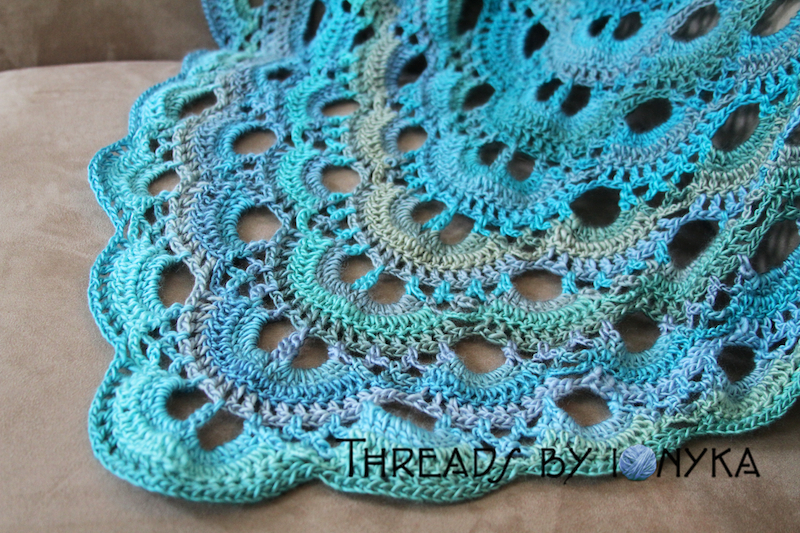 My guess would be if I were to make another one with this yarn (which I hope to do again soon!) and choose to wash it I would put it in a mesh laundering bag so it does not get tangled up. If I happen to, I will certainly post some updates about it here on the blog. Thanks again! Thanks a lot for your reply… thanks for the tip. 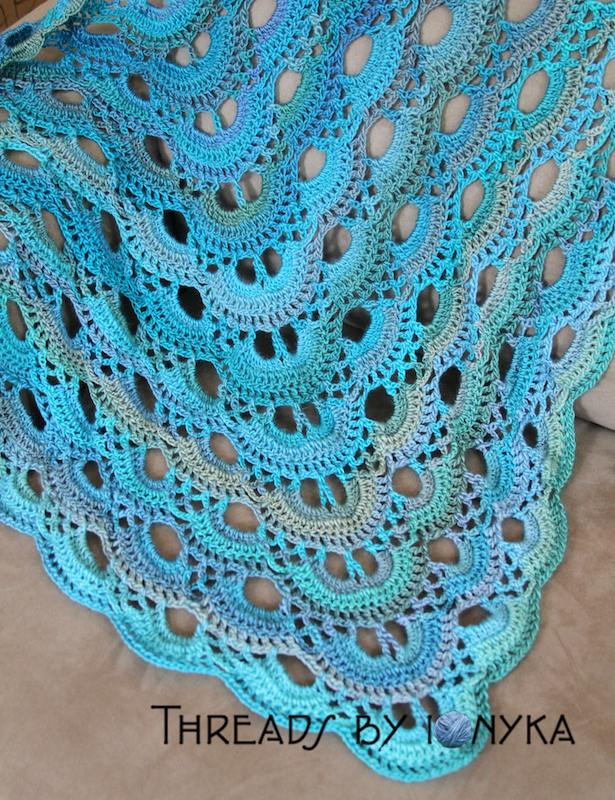 Sure I will try it out and update here after finishing the shawl… thanks again. 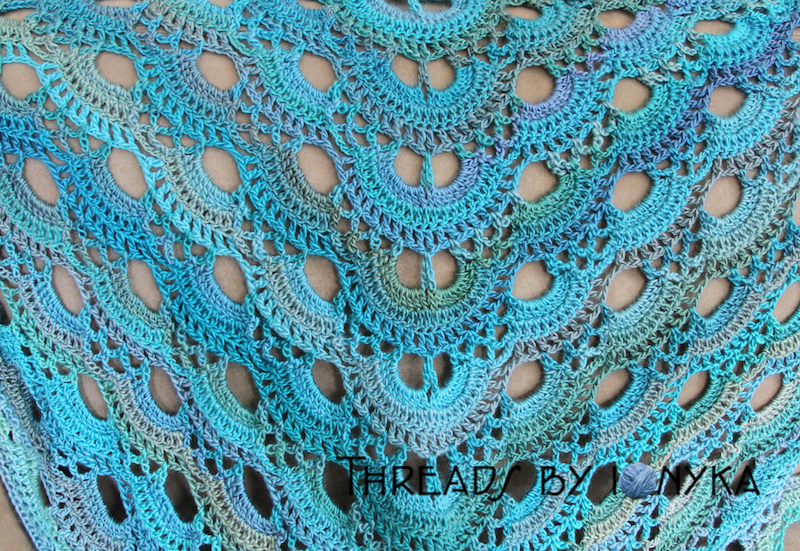 I wrote the English version of this shawl. Could you please put in my name and not just the link? It would be great if you would actually reference it to the Ravlery site instead. Hey Michelle, absolutely I have changed my link to go to your Ravelry post instead as requested, thanks so much! You are all so very kind and wonderful to share this wonderful pattern! I have spent the past two days trying to get the English translation to this pattern. I’ve followed the links on Ravelry and all I get are some photos on a Facebook page. I have used Google and reopened an old Google account to get the document. No luck. I am kind of stuck recovering from knee replacement AND a bunch of dental surgery. I have the wool and the hooks sitting right here. If someone has a German version, I can probably get in translated since I have a good friend who has a daughter with a masters degree in German and who spent a year in Austria and who knits and crochets, so I should be good there. Thanks. Sorry you are having trouble getting a copy of the original pattern, it seems like the link from her Ravelry page is not working right again. I hope she fixes it soon! I would love this pattern. The link to Ravelry is not working!!!!! Please post the pattern!!! Thanks Beverly for the link!! I’ll add it to the post above so others can find it easier as well. http://www.ravelry.com/patterns/library/schultertuch—dreieckstuch Scroll down to find the free English version. Sorry about that I fixed the link it works now! How much yard did you use? I want to use the 3 ply yarn. Thanks. Hi Marcie, I used about 3.5 skeins of the Red Heart Unforgettable yarn so if you are planning to use that I would get 4 skeins to make sure you have enough, thanks! Thank you so much for posting your beautiful work here! 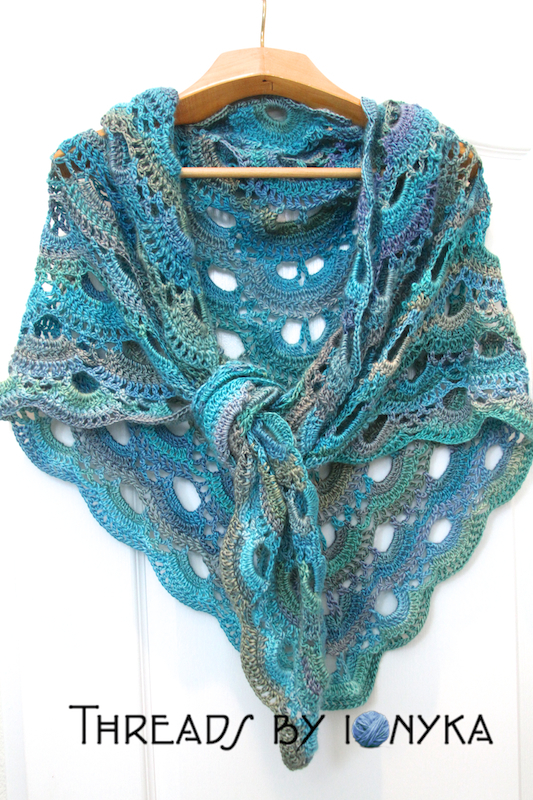 You have inspired me to make two of these gorgeous shawls! It would have been impossible without your help! You are so welcome! Would love to see how they turn out please come back and post a pic! I can’t find the English version of this…the links don’t appear to work. Can someone help me locate the English version? Otherwise Ill have to see if I can find another written version. Ill update the post if I do! Hi Lerae – Yes I link to the pattern I used in the post, also check the other comments for other links as well. Thanks! Every time I go to download something from any site that has this download program, or app, I get a message from McAfee, do you want to go there it can read and change what i am looking at can change or manage my apps, and other things it mentions. I don’t know whether to go ahead and download or not. I sure would like to have this pattern, It is beautiful. All the patterns are beautiful. Hi Nancy, this pattern is not mine therefore the links I include are to other sites that I have used to download the pattern in the past so I cannot directly address your issue, but hopefully you are able to find a way to get a copy, if the one via Ravelry works still I would recommend trying that one. Good luck! 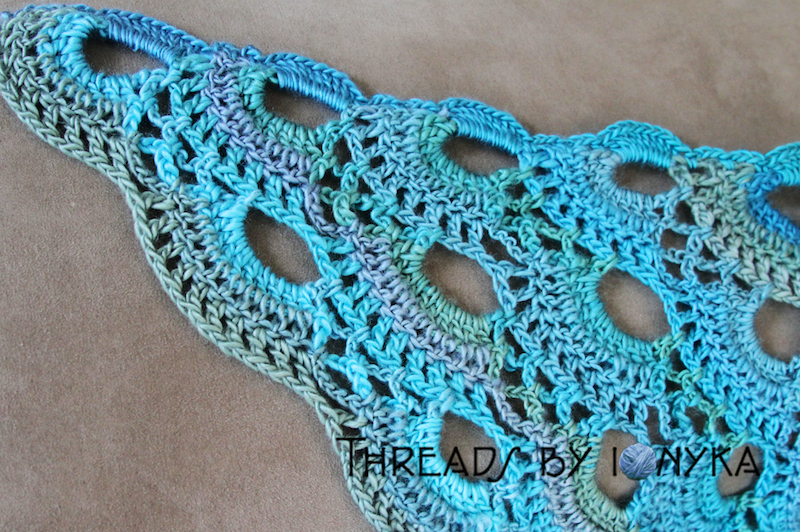 Thanks for sharing the lovely picture of the shawl. 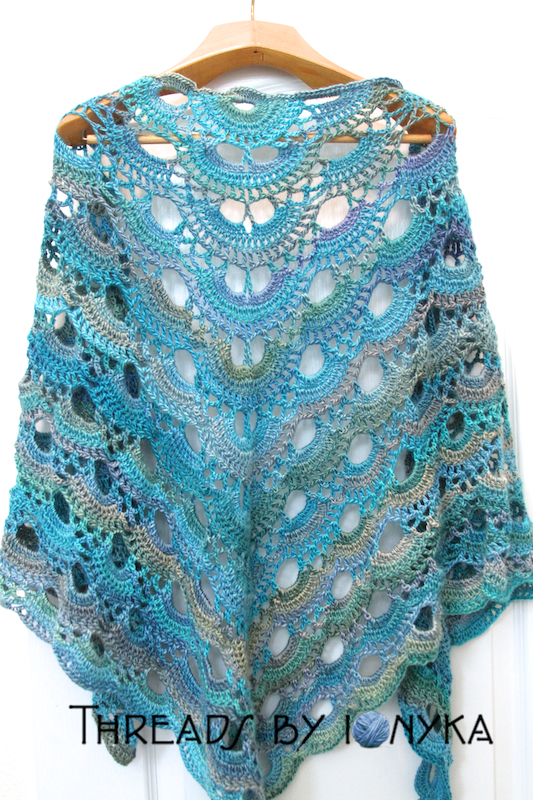 I am making prayer shawls for pastor’s wives, and saw this one, I will make this one and try it with the beads. What sizes of beads and best? Sharon – glad you want to give it a try, it is really fun to make :) I have not used beads when making this so I cannot say but if you check out this yarn at a craft store I’m sure you can take it to the bead section and find some that might work. Good luck!